For more information about how isolation segments work, see the Isolation Segments section of the Cloud Foundry Security topic. For more information about creating isolation segments, see the Managing Isolation Segments topic. A shared Isolation Segment is the default isolation segment assigned to every org and space. This can be overwritten by assigning an explicit default for an organization. For more information about creating isolation segments, see the Managing Isolation Segments topic. Below are examples of cloud config for GCP and AWS for the four example subnets described above. Note: AWS networking requires security groups, which need to be created separately. In the below example, the operator must create the sample-shared-is and sample-is1 security groups. You must edit the BOSH deployment manifest to include an instance group for each set of routers. The sample BOSH manifest snippet below includes an additional instance group for the isolated routers, associated with the isolated BOSH AZs. As a result, router instances will be configured with IP addresses from the isolated subnets. Note: For a high-availability deployment assign each instance group to at least two Bosh AZs that correspond to different IaaS AZs. Use at least two instances of each instance group. 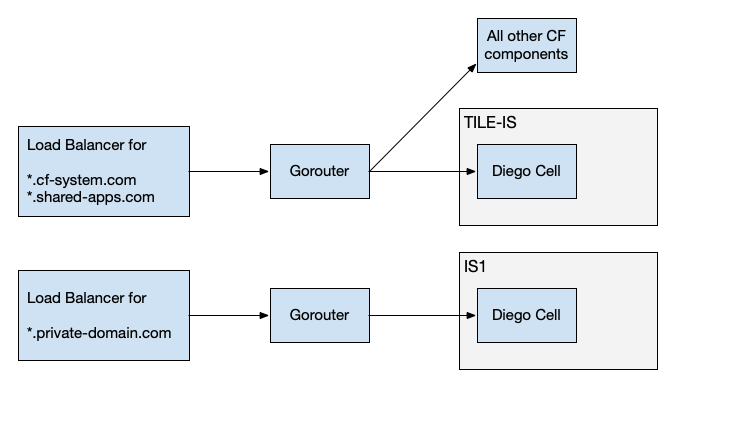 Note: When deploying with a BOSH v2+ style manifest, that leverages instance_groups, you must enable UAA to differentiate between links exported by the Gorouters, as it will only accept connections from one instance group of Gorouters. As you may have multiple isolation segments, we recommend renaming the instance group used for the system domain. You will also need to specify the name of the link that UAA consumes the link from. For some IaaS (e.g. AWS, GCP), the BOSH Cloud Config and deployment manifest can be used to instruct BOSH to add routers to the IaaS load balancers automatically. For others, operators must assign static IPs to the routers in the manifest and assign these IPs to the load balancers out of band. The vm_extension is IaaS specific and defined in Cloud Config. Below is an example AWS cloud config. Note: The load balancer sample-is1-elb must be created separately. Note: If necessary, configure a firewall rule to allow traffic from your load balancer to the Gorouters. To provide security guarantees in addition to the firewall rules described above, an operator can configure sharding of the Gorouter’s routing table, resulting in a router dedicated for an isolation segment having knowledge only of routes for applications in the same isolation segment. 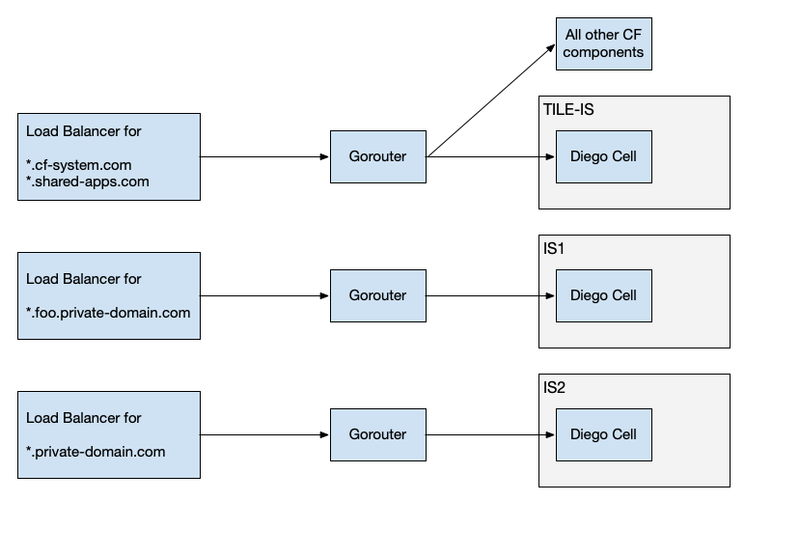 The flexibility of the configuration also supports deployment of a router that is responsible for multiple isolation segments, or that excludes all isolation segments. Support for router sharding depends on bypassing the Cloud Controller Bridge (CC Bridge), which is now the default behavior of cf-deployment. To manually bypass the CC bridge, set cc.diego.temporary_local_apps: true in your cloud_controller_ng, cloud_controller_worker, and cloud_controller_clock jobs in your deployment manifest. 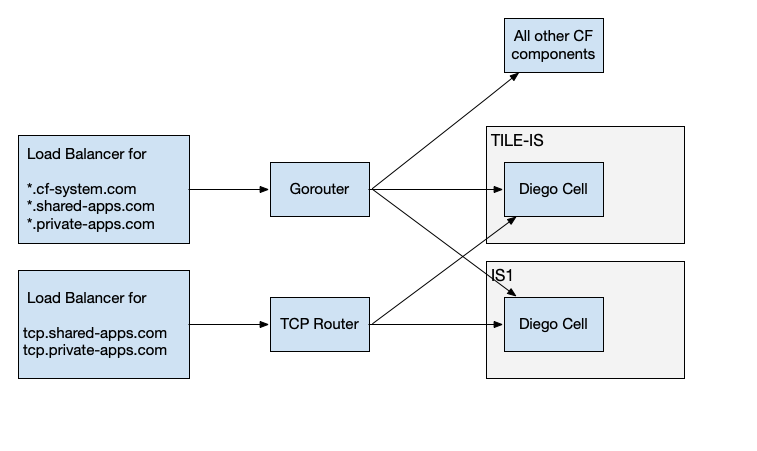 This enables the Cloud Controller to send app creation requests containing routing isolation segment information directly to the Diego BBS, rather than through the CC Bridge. Configuration is achieved using two manifest properties, routing_table_sharding_mode and isolation_segments. The three supported values of routing_table_sharding_mode are all, shared-and-segments, and segments. all: All routes will be registered. This is the default mode to preserve the Gorouter’s existing behavior. shared-and-segments: Both routes configured with manifest property isolation_segments and routes without an isolation segment specified will be registered. segments: Only routes for the configured isolation segments will be registered. You can provide a list of isolation segments using the manifest property isolation_segments. shared-and-segments provided Routes that are not associated with an isolation segment, as well as routes for the specified isolation segments. Routes for other isolation segment will be excluded. segments none Invalid combination. Deploy will fail. segments provided Routes for specified isolation segments only. The router_shared router will register all routes that do not have an isolation_segment value. The router_is1 router will only register routes that have an isolation_segment value of is1.